Ah, the Mediterranean in early June, when every yachtsman feels he has a right to decent weather. And sure enough, when I got there it was warm, with low humidity and calm seas. Perfect conditions—except for boat testing. 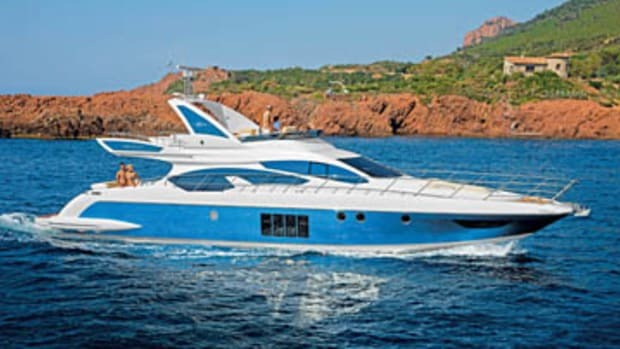 In the new marina at Varazze, 15 miles west of Genoa on the Ligurian coast, Azimut&apos;s new service and delivery center was abuzz with activity. The shops all looked ready for a busy season, and the waterside cafes and restaurants seemed remarkably lively for so early in the day. But then again, this was Italy, where sitting in the sunshine with a croissant and a cappuccino is all in a day&apos;s work. It was all I could do to tear myself away. 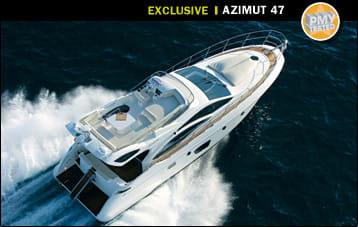 There&apos;s a lot about the new Azimut 47 to make such sacrifices worthwhile. You notice something out of the ordinary as soon as you step into the saloon. It&apos;s not the decor, a pleasing combination of bleached oak, cream deckheads, and upholstery, with any accusations of blandness kept cleverly at bay by the contrasting chocolate brown of the leather surfaces and window moldings. It&apos;s not even the dinette, up forward on the port side, with its extending table making an excellent breakfast bar or navigator&apos;s perch. It&apos;s the ingeniously achieved impression of size. To start with, there&apos;s a lot of window area, on all four sides, to let in plenty of light. Then the galley has been set down a level, forward of the dinette and out of the way. The sofas look big enough for a soccer team—a seven-a-side one, anyway—with low backs to make them as unobtrusive as possible. And finally, the thin, stainless steel legs under the dinette and helm seats, along with their single back support, allow uninterrupted sightlines throughout. 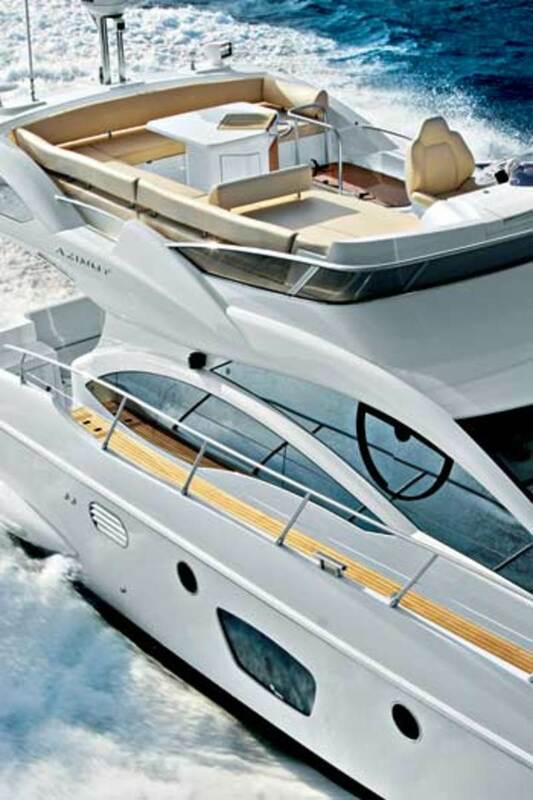 It&apos;s cleverly done and looks like the main deck of a 50-footer, or even a 52. Two significant options are available in the saloon of the 47. The first of these is a 41-inch-wide sofabed, which unfolds from the starboard side. The other option is a sideboard in place of the sofa located to port. In a saloon that normally lacks stowage in its standard layout, this could be pretty useful. There are more surprises to come. Step down the forward companionway, and you find the galley on the port side, under the windscreen. It has an opening porthole and limited stowage under the counter, beneath the sole hatch, and in an eye-level locker, although the fridge-freezer is a generous size. From this central lobby by the galley, you might find yourself instinctively turning aft, as I did, to find the owner&apos;s cabin. But you&apos;d be wrong. We&apos;ve come to expect full-beam, midships owner&apos;s suites even on 40-something footers. Their popularity has had a tyrannical effect. It&apos;s not that you can&apos;t fit a good one into this size of hull, it&apos;s just that if you do, there isn&apos;t often a lot of room for anything else. It&apos;s usually the third cabin that suffers—if there is one. 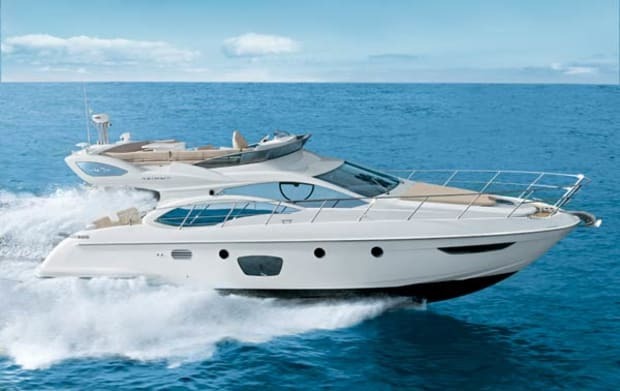 Azimut has held its nerve on the 47, however, placing the owner&apos;s suite in the traditional slot up in the bow, leaving the midships area for guests. The result is a vindication of clear thinking and sensible design. 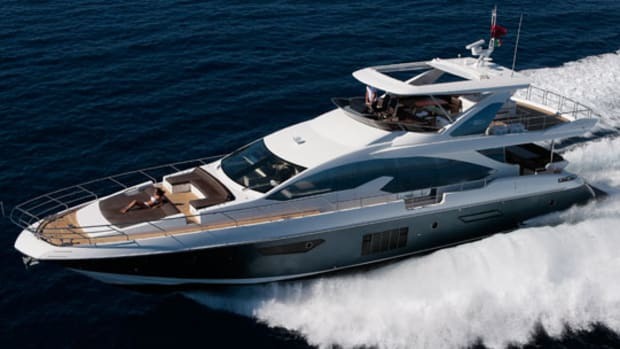 There is plenty of room forward for a luxurious suite—especially with Azimut&apos;s distinctive bow shape—and the 47 combines a full-size double bed (6&apos;4"x5&apos;0") with generous stowage: two hanging lockers, a large under-berth drawer, and an additional large locker that is revealed when the mattress is lifted on gas struts. The owner&apos;s head isn&apos;t overly large—the door opens into the shower stall—but it&apos;s more than adequate, with the same 6&apos;5" headroom as the cabin and plenty of additional stowage. 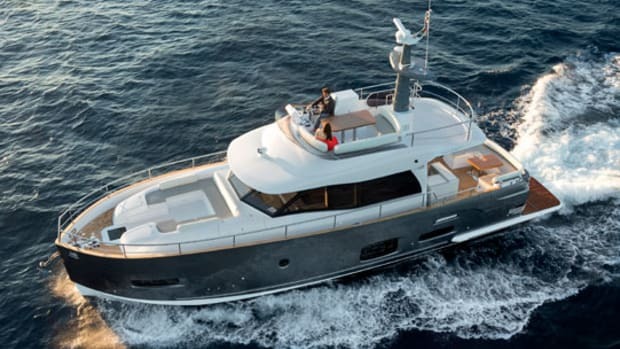 When you do turn aft from the lobby, you&apos;re faced with two doors, each leading into a similarly sized twin-berth guest cabin with 6&apos;4" of headroom at the forward end, reducing to just over 5&apos;0" aft. The starboard one is obviously for your VIPs, with a berth that slides across to create a 6&apos;3"x4&apos;8" double (cleverly, the drawers in its base open both ways). 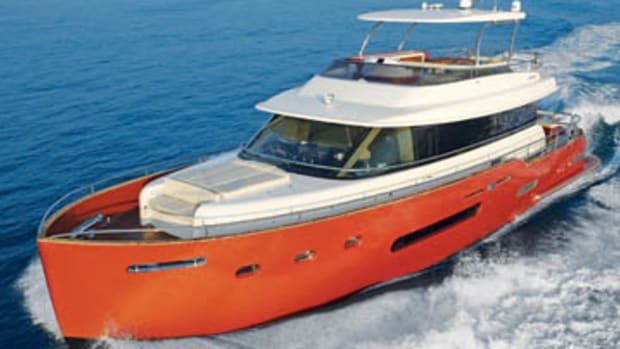 It also has access to the head, which is the same size and layout as the owner&apos;s.
Of course, plenty of owners will want a midships master cabin, even on a 47. 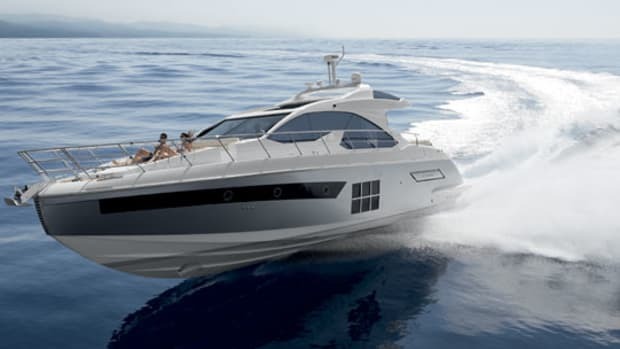 But with this boat, Azimut seems to be banking on the fact that there are enough of you out there who are prepared to put up with slightly less personal space so that your friends can have more. Good for you. Come morning, however, not everyone will be as well rested as your guests. The single crew cabin in the stern is an option and should perhaps stay that way. What seems like a lot of space for a bunch of casually stowed fenders is, to a human, little more than a coffin with extra headroom. If you do find a captain who is actually prepared to live there, keep an eye on him—he&apos;s probably mad. Out at sea the 47 seemed inclined to enjoy herself. Acceleration was exceptionally lively. 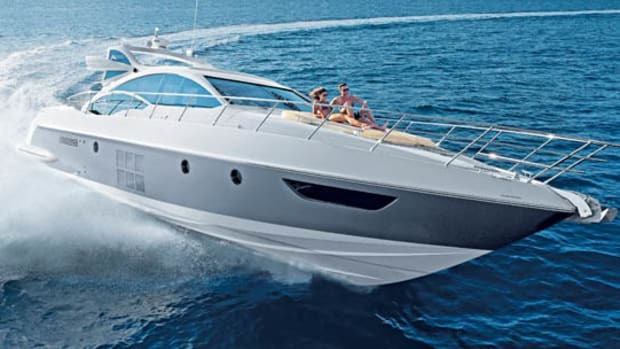 My yardstick for a cruising boat is 20 knots (23 mph) in 20 seconds, but the torque of the Caterpillar C9s gives the 47 a real kick up the backside. She was past 25 knots (29 mph) well before the stopwatch reached 20. Boatbuilders often look slightly askance when I insist on measuring acceleration on comfortable cruising machines, which clearly have no ambitions to be first away from the lights. But these numbers do give a useful indication of throttle response—and that&apos;s important on any planing boat, especially when the weather cuts up rough and you want the boat to react quickly to whatever&apos;s coming. Of course, taut throttle reactions are only half the story. In rough-weather handling, you also need instant answers to your helm inputs, so you can pick out an accurate course between the waves. Here, this first 47 off the line was a bit of a letdown, with a distinctly unenthusiastic helm response. The turning circle looked a good 400 yards across, but catching up with our wake (the only lumpy water available) took so long there was hardly any of it left by the time we got there, although when we did manage it and carved our way through, I was quite impressed with the hull&apos;s soft ride. It&apos;s all a question of style, of course. Some helmsmen simply prefer to slow down in choppy weather rather than coming on like some wannabe raceboat driver. But we all have to deal with our midlife crisis in our own way. 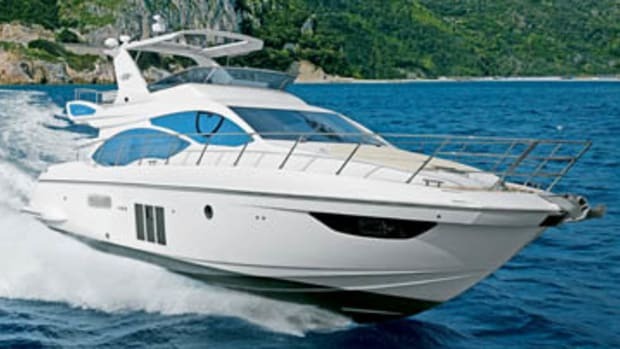 The Azimut engineer onboard also admitted that he was a bit disappointed with the steering. Eleven turns lock-to-lock equates to just six degrees of rudder swing for each turn of the wheel, when it should be more like ten degrees. He&apos;s on the case; I&apos;d expect a better showing on future boats. The 47&apos;s in-harbor handling was exceptional, thanks to the optional Sea Energy joystick control system with which she was equipped, but even when I was using just the silky electronic engine controls, she was a pussycat, her big props translating the lightest touches into precise action in both forward and reverse, with no need to resort to the helm. Also, the powerful bow and stern thrusters should prove more than a match for most crosswinds, should the need arise—not that we had the opportunity to put them to the test, though. Back alongside at Varazze, the weather tried to make amends. Unable to supply the wind and waves we like for boat testing, it gave us what it must have felt was the next best thing: torrential rain. Fortunately the cafe had a decent awning. 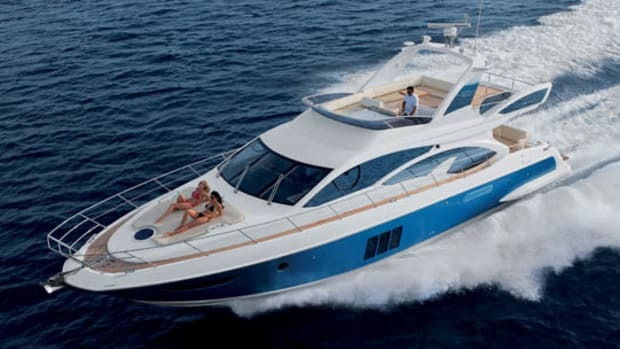 For more information on Azimut Yachts, including contact information, click here. Azimut is great at finish and detail and not averse to adding expensive luxury touches, even at the lower end of its product range. 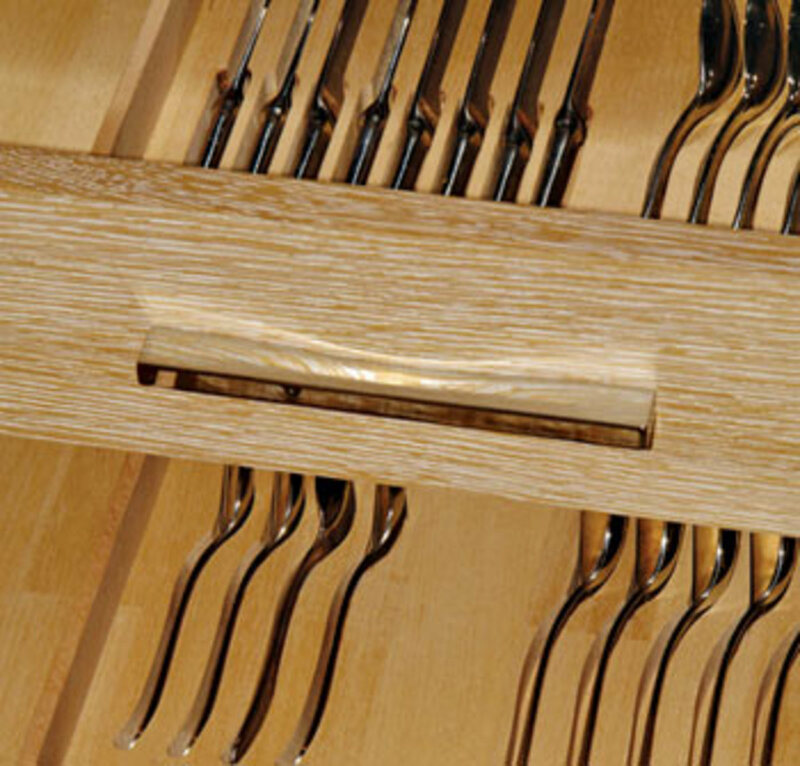 Look at these custom-made cutlery drawers. I&apos;d seen similar ones recently on the 103S but didn&apos;t expect to find them on a 47. The saloon table is also neat. Its pedestal base extends upwards at the flick of a switch, and the top can be rotated through 90 degrees and unfolded, doubling in size. And the cockpit locker door on the starboard side is clever, too, with racks just the right size for cans of gearbox oil.—A.H. 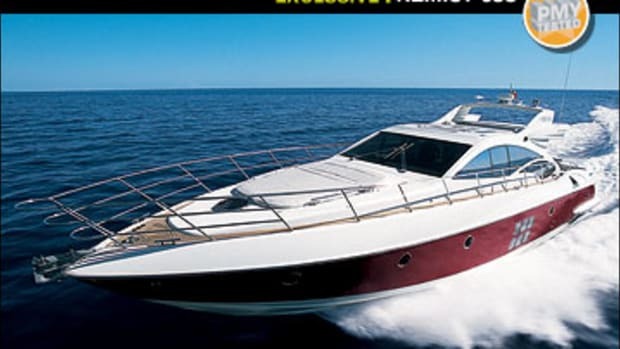 This article originally appeared in the September 2007 issue of Power & Motoryacht magazine.